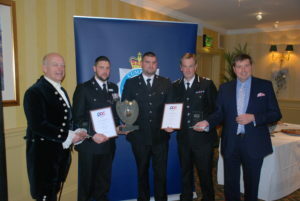 Cumbria’s Police and Crime Commissioner Peter McCall has awarded the annual Commissioner’s Bravery Award to two officers from Cumbria Constabulary. Special Constable Neal Collins and Police Constable Joe Rossiter went to the aid of a man who had doused himself in petrol and was holding a lighter in Carlisle in July 2016. The two officers received the Chief Constable’s Commendation for Outstanding Bravery for their actions at a ceremony in May 2017. Peter McCall said: “Special Constable Neal Collins and Police Constable Joe Rossiter were incredibly brave and their selfless actions undoubtedly helped save the life of someone who was clearly in distress at the time. “It makes me immensely proud to hear the details of officers’ bravery and this incident highlights the courage and dedication of the officers serving the people of Cumbria. Both officers have shown commitment to duty way above that expected and I would particularly note that Neal as a Special Constable is the epitome of the dedicated and heroic volunteer citizen which is the hallmark of all officers serving our communities as Special Police Officers.